Now that you’ve met my helper Roy, I’m going to show you what we’ve been up to. 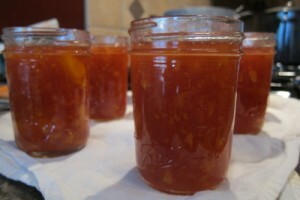 When you make your own jams, jellies, relishes, sauces, or whatever, you are in control. You get to chose what goes in to your gluten free recipes. You get to decide how much sugar you want or what kind of ingredients go into the things you eat. You can use organic ingredients, low sugar, no fat, non gmo ingredients, the list goes on. It’s great to be in control of what you and your family eats. That’s one of the reasons for canning and making your own jams and jellies. Another reason is the satisfaction that comes when you make something from your own hands. You went and picked out the produce, either on the farm or at the farmers market or your own back yard. You carefully chose what to put into each jar. You ladled and sealed and put away a little bit of you in every thing that was loving made by you for the ones you care about the most. That’s why I continue to can even still. Go ahead, be proud about what you do. So, here’s the recipe for the peach jam, the way we like it. Wash your peaches well. Cut them into wedges and place them into the bowl of a food processor. I usually put in three at a time so they chop up better. I do not peel mine. I think it’s a waste of time and by using the food processor the skins are chopped very fine and I don’t think it effects the jam. Your choice. I used to peel and decided one day not too and haven’t since. < Using the pulse switch, pulse until finely chopped. Place the chopped peaches, lemon or lime juice, 1 tsp. of butter or margarine and the box of powdered pectin into a large stock pot. Mix well. Bring to a boil and boil for 1 minute. The margarine helps to keep the jam from foaming on top quite so much. If you try making a batch without the margarine and one with you’ll see what I mean. Then add the sugar all at once. Stir well and bring to a boil again, boiling for 2 minutes this time. Turn off the heat and ladle into hot pint or 1/2 pint jars. Wipe off the rims and seal with lids and rings. Lower into the canner filled with hot boiling water. Boil to seal for 5 minutes if under 3000 ft elevation and 10 minutes for above that. Set aside to cool for 12 hours or over night. Make sure the lids are sealed by pressing on the top. It should not bounce back. If it does, it didn’t seal so pop in the frig and use that one first. Wipe down the jars, take off the rings, label with the date and peach jam on the lid and place on the shelf. Spread on toast and enjoy. These make great gifts for the holidays. I always make a lot because everyone wants some.